Now that the Sailor Moon Crystal Dice Challenge game has been released Dyskami Publishing has announced that it will release a Sailor Moon Crystal Season III expansion in October or November of this year. This will cover Sailor Moon Crystal’s third season which tells the story of the Infinity arc of the manga. 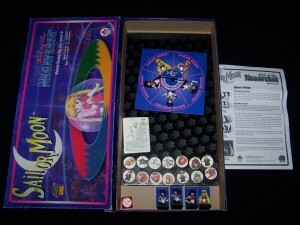 The original game included characters from the first two story arcs which had Dark Kingdom and Black Moon heroes and villains. The season III expansion will include the new Sailor Guardians Sailor Pluto, Uranus, Neptune and Saturn. Sailor Pluto was originally included as a pre-order incentive with the original set. The villains in this expansion will include the the Death Busters’ Witches 5 and Mistress 9. 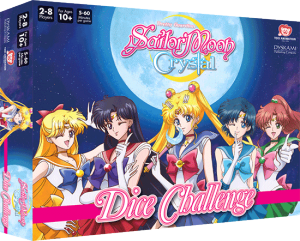 Since this is being sold as an expansion it seems likely you will need the original set in order to play it so be sure to order Sailor Moon Crystal Dice Challenge from Dyskami Publishing’s online store. 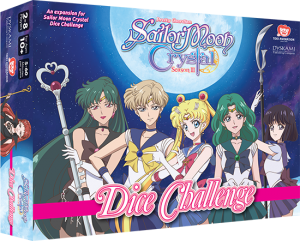 Have any of you tried out the Sailor Moon Crystal Dice Challenge game? What did you think of it? 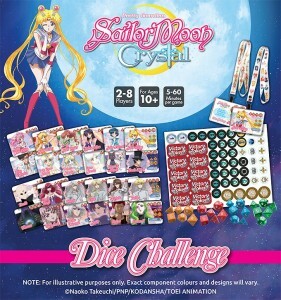 The upcoming Sailor Moon Crystal Dice Challenge game is now available for pre-order on the Dyskami web site for $35. The game should be ready to ship in April or May of this year. The pre-order page includes a bunch of details about the game including photos of what’s included. 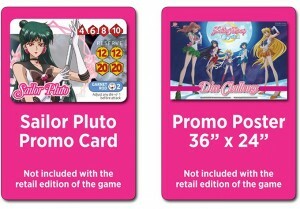 As an incentive those who pre-order the game now will get a special Sailor Pluto game card and Sailor Moon Crystal Dice Challenge poster. The pre-order is a crowd funding campaign with a goal of $10,000 dollars and it seems likely that it will hit that goal before the deadline of March 9th. A video included on the page shows the game being played at the pre-release tournament held in Guelph in December. You can watch it below. The game will ship to the US or Canada. Unfortunately it can’t be shipped elsewhere due to limitation of the licensing deal between Toei and Dyskami. The game is set to be released in May. 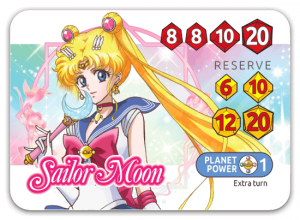 At this point we have images of all of the cards included with the game and the characters cover the Dark Kingdom and Black Moon story arcs of Sailor Moon Crystal. 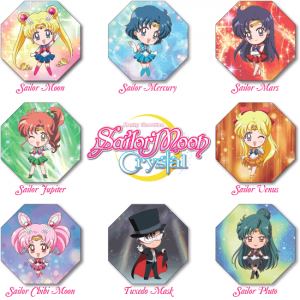 For heroes we have Sailor Moon, Mercury, Mars, Jupiter, Venus and Chibi Moon as well as Tuxedo Mask, Luna and Artemis (as a single card), Queen Serenity, Princess Serenity, Neo Queen Serenity and King Endymion with Sailor Pluto as a pre-order exclusive. For villains we have Jadeite, Nephrite, Zoisite, Kunzite, Queen Beryl, a generic Droid, Esmeraude, Rubeus, Saphir, Prince Demand, Black Lady and Wiseman. I’ve got my game pre-ordered. What about you? 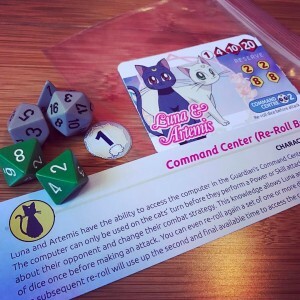 It looks like the upcoming Sailor Moon Crystal Dice Challenge game is getting a bit closer to release! The game, which is currently scheduled to be released this Spring, will be available to pre-order on February 8th from Dyskami Publishing. Fans are being encouraged to follow their social media pages on Facebook, Twitter or Instagram and check out the Dyskami web site on February 8th for more details. 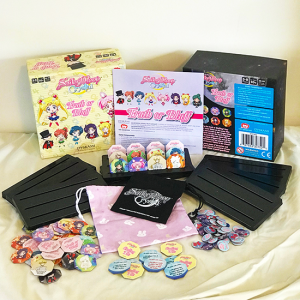 I received news from Dyskami Publishing that those who pre-order the game should expect some amazing bonus Sailor Moon Crystal gifts. Some fans have asked if this game will be available in Canada, since often it’s harder to get some board games North of the border. Since Dyskami Publishing is an Ontario based company we should expect to see this in stores here in Canada. Do you plan on picking this game up? 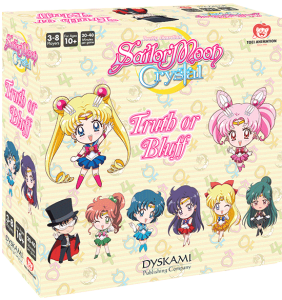 Earlier this year we mentioned that there were two Sailor Moon Crystal themed games coming out soon by Dyskami! 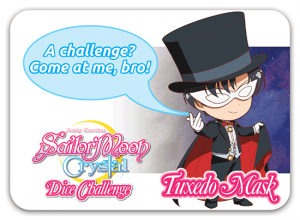 The first, Sailor Moon Crystal Dice Challenge, is near release! A free promotional tournament is being held next weekend, on Sunday December 3rd, at The Boardroom: Guelph’s Game Cafe in Guelph, Ontario. The event will be limited to 48 players so be sure to show up early! It runs from 3pm to 7pm. In addition to being able to play the game fans who are dressed as their favourite Sailor Moon character will get a free copy of the game when it’s released! No specifics on how they will determine who exactly your favourite character is, but don’t tell me I didn’t warn you if you’re turned down for only wearing a costume of your second favourite character! So when can we expect this game in stores? Dyskami Publishing posted an update to their Facebook Page mentioning that the reason for the delays were that they weren’t happy with the prototype they got from the factory they were dealing with, prompting them to look for a new factory. Current expectation is that the game will be available in stores in Spring 2018. As always we’ll have more information on the site as we get it. No indication of when the other Sailor Moon Crystal game, Truth or Bluff, will be available. 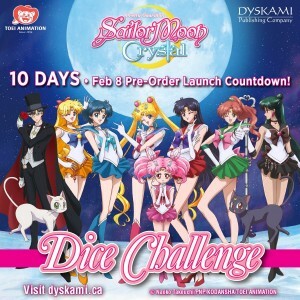 By the original scheduled mentioned by Dyskami Publishing that game was to come out after Sailor Moon Crystal Dice Challenge and it appears that this is still the case. Details about the event can be found on the Eventbrite page. Will any of you be attending this event? While I’d love to make the 5 hour or so car ride to Guelph to attend I have this thing on the Saturday where I’m getting married so I don’t think I’ll be there.